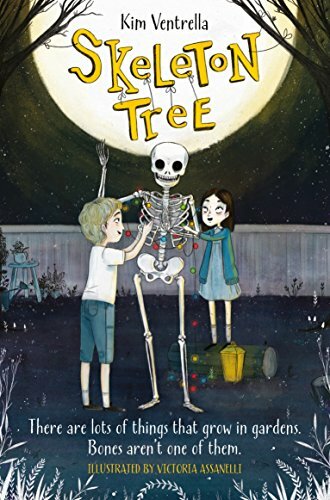 The Skeleton Tree starts out as a bony finger growing out of the earth in twelve-year-old Stanley’s backyard. Stanley is struggling to deal with all the tension in his household; his father left ten months ago with no explanation, his mother is working long hours, trying to cope on her own, and his young sister Mirin has a chronic illness. Mostly he’s coping well, distracting himself with his favourite video game Skatepark Zombie Death Bash, and spending time with his best friend Jaxon. When he’s stressed, he imagines a zombie character called Slurpy can devour all his problems, so he can continue to be helpful and supportive to his mum, his sister and the neighbour who minds them, Ms. Francine. The skeleton continues to grow out of the ground, and Stanley and Jaxon try to take photos of it, so they can enter a science competition. Stanley thinks that if he can win, he can get his dad to come back home again, and the prize money can help pay the hospital bills. But the skeleton refuses to co-operate. Having fully emerged, he’s strangely elusive, appearing at unpredictable times and only visible to children and a few adults such as Ms. Francine. Mirin loves the skeleton, who she calls Princy, as he makes her laugh. Stanley is intrigued by him, but fearful, especially when Jaxon tells him all about the tales of the grim reaper. In one of their photos, the boys can see a scythe at the skeleton’s feet. Stanley thinks in order to save his sister, he needs to keep her away from Princy’s clutches, but it isn’t quite as simple as that. The book is about courage and coming to terms with loss in a family. The magical element adds a delicious other worldly dimension to the story. The skeleton is unsettling and scary when it first appears, but its antics make Mirin laugh, and gradually Stanley comes to accept the part it plays. There are many issues to discuss in this well-crafted debut novel, and the originality of its images and ideas stay with you.